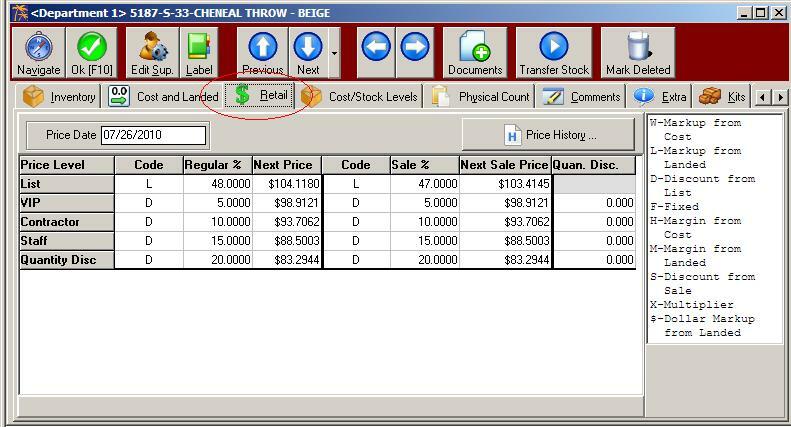 Changing prices for inventory can be done by adjusting the Code, Percentage or Price in the retail tab of the inventory item as seen in Figure 1. The price adjustment report will show all parts based on a fiter (Category or Supplier filters). The video link below is for a demonstration of using the Price Adjustments report. NOTE: The Price Adjustment report will display up to 50 items. The report will adjust items beyond the 50 displayed. For example if a category search is performed that has 100 items, 50 of those items will be displayed but the adjustment will apply to the full 100. If the new retail price information is contained in a data file then we may be able to use the Data Load tool to update the prices.